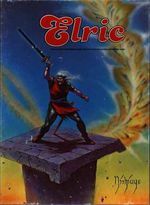 Based on Michael Moorcock's Elric series, this war game attempts to bring the various conflicts together: War, politics, magic, and the balance between Chaos and Law! Individual characters play an important role, as is magic, since spellcasting affects the cosmic balance between Chaos and Law. Includes 6 scenarios for 1-4 players.